How to Counter Piper Properly | Brawl Stars UP! Although Piper is the new Brawler which was just released a few days ago, we can easily see so many players using this Sniper in both low and high trophy games right now. I also see too many people complaining about how hard it is to deal with her even after the nerf. Thus, I decided to write down some small but useful tips for you. Hopefully you will find them helpful! I will list some basic stats of Piper at here. For more details, you can take a look at here! As you can see, at the furthest distance (40 tiles), Piper can deal 460 damage, making her one of the best supports at the moment. Luckily, due to the recharge time (3 seconds), you will find it easier to get close to her. Yes I know that almost everyone already knows this. But trust me, I have seen tons of people running in a very-predictable pattern and getting those 460-damage shots. Always run in an unpredictable pattern my, not only vs Piper but also vs Brock, Ricochet, Colt and the others. Say no to straight line. Normally we don’t do this but due to her damage and the reload time, you SHOULD do this. If she fires 3 times in a short period of time, you will find it easier to make the right moves. This is the most efficient way to deal with her and is the rule of thumb you must remember. But of course not too close If she already has the Super otherwise you could take up to 900 damage. Because she deals a lot more damage to the targets afar, why don’t we just find away to approach her? She will deal less damage and can only shoot again after every 3 seconds, you will have a big advantage. Don’t forget to make the most of brushes and walls. Don’t use your Super to clear obstacles unless it’s emergency. Piper is weak in maps which have lots of obstacles. At the first time I saw he, I immediately thought that she would be shinning in Bounty games. Bounty is undoubtedly her strongest game mode as in Bounty game, you can just stay at your side of the map and throw everything you have to the other side. Never stay in an open arena for too long to prevent her from hitting you with ease. Don’t use your Super to remove obstacles unless you are going to get those 6 stars or you have just a few seconds left. Don’t let her earn too many stars at all costs. At the late game it will be very hard to approach her and get those stars back If her team can backup her well. Moving through the brushes and try to burst damage up close as fast as possible (Bull, Primo, Shelly…). 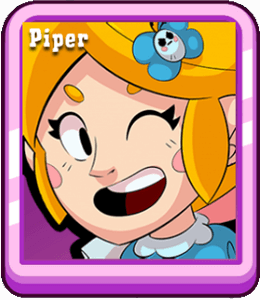 Piper is pretty strong in Heist games, especially on defense. As we all know, in Heist, the team that takes the choke point on the map overtime would win the game. With the insane attack range and damage, taking control over the choke is not hard for Piper. Your best bet in this case is to use Brock/Colt to consecutively apply pressure, forcing her team to back off the spawn point. If you use Bull, get the Super asap so you can approach her, apply the pressure and get the next Supers easier. In Smash & Grab games, Piper players don’t usually carry Crystals because they are at the back most of time. The best team to deal with Piper in this mode should have at least 2 of these: Shelly, El Primo, Nita, Bull,… Your team should be sturdy. Play aggressively. Never stop applying pressure. Don’t destroy obstacles very soon! It is obvious to see that Piper is not ‘strong’ at all in this game. With a lot of obstacles, it’s hard for her to shoot show off here. Also, once the gas starts spreading out, Piper will find a lot of struggles. Also, the strongest (most popular) Brawlers in Showdown are Bull, Shelly and El Primo, which are all hard-counter to Piper in this mode. Don’t be scared If you face her in Showdown.